Standardisation is the voluntary process of developing technical specifications based on consensus among all interested parties (industry including Small and Medium-sized Enterprises (SMEs), consumers, trade unions, environmental Non Governmental Organisations (NGO), public authorities, etc). It is carried out by independent standards bodies, acting at national, European and international level. For various scratch hardness tests, e.g. in accordance with the process used in the industry making plastic panels. 5 different tools with diamond or carbide scratching tip. 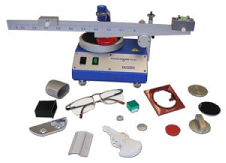 Force range: 0.1 – 10 N.
Portable and handy instrument especially designed for tests on enamel in accordance with DIN 51 155. Enables the user to carry out tests on site.